The Tormek water stone grinding system is certainly one of the most advanced grinding and honing systems on the market. With a grinding stone cooled with water and running at a very low speed, it prevents overheating of your chisels, blades or knifes, giving them more durability and longer sharpness. Being a water cooled grinding system, it does not produce any sparks whatsoever, which is certainly an extra safety benefit. Tormek, a swedish company, also offers an enormous amount of accessories in order to sharpen nearly every different type of tool. From chisels, carving knifes over to woodturning flutes up to straight plane blades - it seems there is no end to the applications. The waterstone grinding system consists basically of a two wheel bench grinder running at very low speed of 90 RPM. Unlike traditional bench grinder one grindstone runs permanently in a tray filled with water. With the 250mm aluminum-oxide grindstone, it can be used even for sharpening HSS steels. The other disc is a 220mm leather honing wheel which gives the extra fine edge. The unit already includes a universal support bar with a fine adjustment where most tormek jigs and guides are attached to. The most important guide for any woodworker is also already included. The straight edge jig is ideal for sharpening hand planer blades and chisels. It guides the blade precise parallel to the grinding stone. With such an enormous variety of different jigs available, it is difficult to select the most important ones. The one I like most is called Multi Jig, which is ideal for woodturning chisels, whereby it does not matter if there is a straight flute or curved edged. Another very versatile guide is the tormek universal gouge. I use it for my small sized woodturning flutes. In case you do a lot of carving or woodturning, you might also have a look at the profiled leather wheel. I know that every woodcarver and wood turner has its special way of honing, but the leather disc together with the right compound produces one of the sharpest tools I have ever come across. There are many more accessories for the water stone grinder available, which make it even more versatile. From scissor sharpening to knife and axe grinding, all sorts of jigs are available. 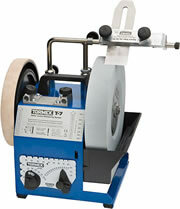 This makes the Tormek water stone grinder such an important tool for any professional woodworker.